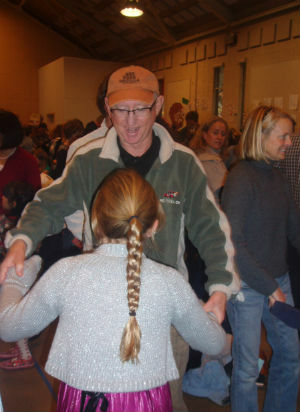 To better accommodate all of the students and their families, the school held two separate morning performances. And while the student stars and their sometimes-hesitant parents changed at each show, the songs and celebratory mood — six days left until vacation — were the same. 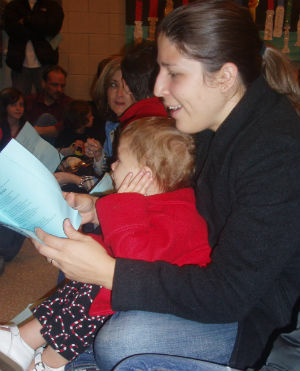 Organized by music teachers Mary Beckstrom and Bob Crabb, the Winter Sing is a Laurel tradition that features holiday standards like Deck the Hall, Dreydl, and Feliz Navidad, as well as student favorites like the Laurel original Winter Celebrations, which was written by Mrs. Sako, the pianist at the show. Some songs featured student musicians on the guitar, xylophone, or bells — but all required singing by parents and kids alike. And a few even called for dancing! Wonderful to see my favorite brother-in-law and his beautiful wife at their daughter’s school. Very “cool” especially Daddy dancing with their lovely Cathia. We live in Nova Scotia Canada and send “Seasons Greetings” to you all in the USA.